Draft horse diets are not the same as a pony or light horse; you have to take into consideration their size, their breed and breed characteristics, known diseases and disorders in drafts and even their metabolism, which is slower than their smaller counterparts. As far as basics go, following the recommended amount of feed or forage for the horse’s weight and lifestyle will help you keep your draft in their best condition. 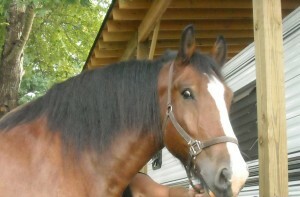 A subject to keep in mind that has been touched on is diseases and disorders in draft horses. Draft horses are especially prone to certain metabolic ailments, such as PSSM, or polysaccharide storage myopathy. This disorder, along with other metabolic issues such as laminitis, founder, Cushing’s, tying up, and shivers can all be managed through proper diet and exercise. In addition to these issues, problems can also occur with bone growth, and because of their size they are susceptible to heat stress and dehydration. Managing these issues include the replacement of starch and sugar calories with fiber and fat calories. In regards to body condition, the same holds true for these big equines. Draft horses should be fed to maintain a moderate body condition, a 5 or 6 on the familiar scale of 1 to 9. A 5 indicates that the spine and ribs cannot be seen however ribs can be felt, the tail head is spongy, and the withers, shoulders, and neck are rounded and smooth. A 6 indicates a moderately flesh horse, with a slight crease down spine, the ribs and tail head feel spongy, and there are fat deposits along withers, neck, and behind the shoulders. So how does one go about feeding these gentle giants? It is recommended that they are fed high quality forage and some concentrates when working. Drafts have a slower metabolism like ponies, which means less energy use and they can gain weight easier. High carbohydrate feeds should be avoided, as a forage with a ration balancer and/or a low NSC feed should do the trick. With metabolic issues and other problems, replacement of starch and sugar calories with fiber and fat calories is one area to look into. Maintaining a high-forage diet is also pivotal and when feeding your draft horses, make sure your equines always have access to water and salt as well. Draft horses of all types can benefit from Triple Crown Safe Starch Forage. This is a grass hay fortified with vitamins and minerals, contains a low NSC level, and is molasses and grain free. This forage is a draft horse’s entire diet and eliminates the need to feed concentrates or supplements to meet vitamin and mineral requirements. In addition, it contains our Equimix technology found in all other Triple Crown feeds. Safe Starch can be fed at 1-2% body weight and can be adjusted to meet your draft horse’s needs and body condition. Safe Starch is a great choice for draft horses with metabolic issues who may have the need for little more calories in their diet. This 6% fat hay can help supply the calories without having to add in any concentrates. Draft horses that are more susceptible to equine metabolic diseases and disorders will also benefit from Triple Crown Timothy Balance Cubes. This is a low protein, mineral fortified forage that contains timothy hay, beet pulp, and specific minerals. This is specifically formulated for horses with Cushing’s Disease, Insulin Resistance, Laminitis, and other related conditions where a nutritious diet low in non-structural carbohydrates is recommended. Feed this to your draft horse at 1-2% of body weight per day as a total hay replacement or use either of these forage products as forage supplement . For easy keeper draft horses that need a top quality, basic forage, Triple Crown Grass Forage is a another good choice. If you do need to provide a grain to your draft horse, Triple Crown Lite is a great pelleted concentrate for easy keepers. Lite helps to balance the nutritional requirements of forage or pasture only diets. Lite is meant to be fed with forage and will give your draft the vitamins and minerals it needs without excessive weight gains. Feed 1 pound of Triple Crown Lite per 500 pounds of body weight, ideally you will feed 3-4lbs of Lite daily to your draft. For an even smaller feeding rate, Triple Crown 30% supplement is another great option. We recommend feeding 1- 2lbs to draft horses when balancing with pasture or hay. Again, these products are nutrient dense and provide your draft with essential vitamins and minerals in a small amount of concentrate; they also contain our Equimix Technology. Managing the diet of any equine companion can be a challenge, but caretakers of draft horses can simplify the task by familiarizing themselves with their animals’ special nutritional considerations and management.